We literally licked our fingers! 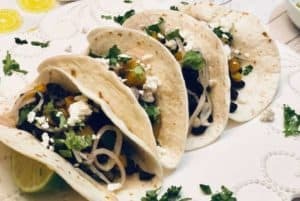 We just love a taco dinner, and this one was extraordinarily good! 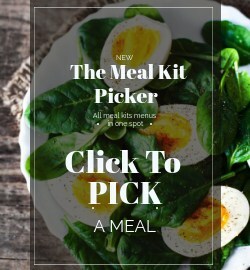 The mixture of flavors in this vegetarian meal kit was just perfect. Also, the portion of ingredients that Home Chef sent was very generous. 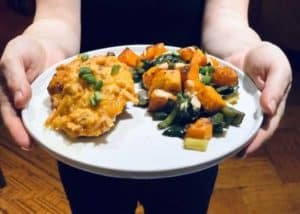 The dish was very easy to prepare – a win-win-win meal! 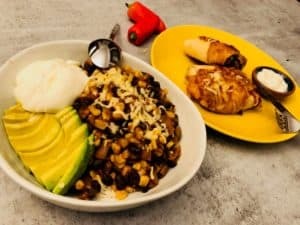 So, what was inside the tacos in this recipe? Great sweet plantains that were perfectly ripe , black beans, large beautiful poblano pepper and cilantro all mixed in a pan with Fajita seasoning. The meal was finished with a very easy to make garnish of pickled red onion, queso fresco cheese and crispy Jalapenos. This final finish gave the dish an extra crunch and spiciness – perfection! We literally licked our fingers! We highly recommend adding this to your order when it is available on the menu.